Parkinson finds excellence, Brazilians Storm Through. After two lay days competition resumed today at the J-Bay Open, stop No. 6 on the Samsung Galaxy World Surf League (WSL) Championship Tour (CT), will a full day of exciting action. The world’s best battled to avoid early elimination as the contest ran through Round 2 and the opening four heats of Round 3 in clean, building four-to-six foot (1.5 metre) surf at Jeffreys Bay. The day saw a return to form for the ‘Brazilian Storm’ after disappointing results in Round 1. Jeep rankings leaders Adriano de Souza and Filipe Toledo along with reigning WSL Champion Gabriel Medina, rookie Wiggolly Dantas and wildcard Alejo Muniz all won through their heats to remain in the contest. The day also delivered its share of upsets with former event winners Taj Burrow (AUS) and Jordy Smith (ZAF) losing out to Muniz and Adam Melling (AUS) respectively while world no. 3 Owen Wright (AUS) was eliminated by Adrian Buchan (AUS). 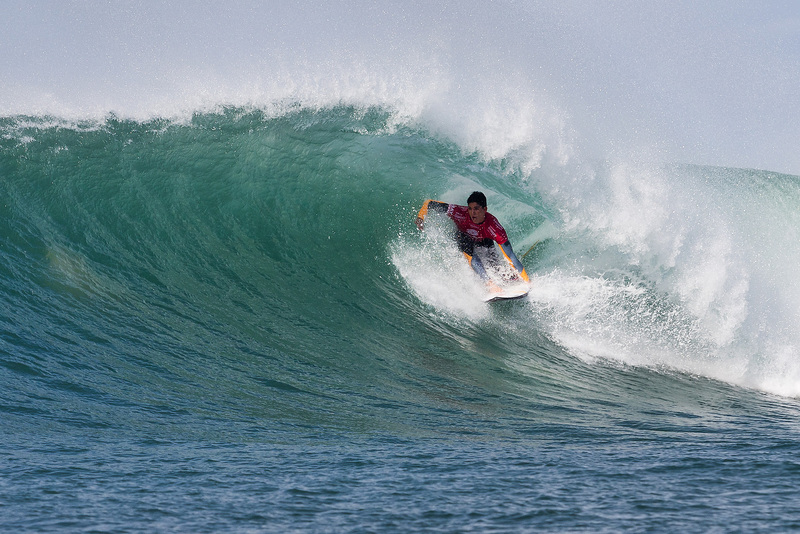 Two-time event winner Joel Parkinson (AUS) and rookie Ricardo Christie (NZL) delivered the heat of the day in Round 2. The pair traded big scores to wow the crowds but it was Parkinson, the 2012 World Champion, who used his experience to lay down a series of huge open-face carves and a quick barrel for a near perfect 9.77. Christie fought back with some classic power surfing in the final minute but it wasn’t enough, and the rookie left the contest in equal 25th place despite an impressive 18.13 heat total. Fellow Australian Kai Otton (AUS) was another standout performers. Otton dispatched Jadson Andre (BRA) after a high-scoring Round 2 battle and defeated rookie Italo Ferreira (BRA) in Round 3. Jeep Leaderboard no. 1 Adriano de Souza (BRA) took on local wildcard Slade Prestwich (ZAF) in the opening heat of the day. A close battle between the pair saw the South African hold the edge through the opening half of the heat but De Souza came back with a long ride down the point to net an excellent 8.33 and take the lead. The Brazilian backed it up with a 6.00 for a win and a place in Round 3 where he will face Dane Reynolds (USA) while Prestwich left his first CT event in equal 25th place. Last-minute replacement Michael February (ZAF) was also eliminated today at the hands of young Brazilian Filipe Toledo (BRA). An early 8-point ride from Toledo was enough to dominate the heat and send February home in 25th place. Reigning WSL Champion Gabriel Medina (BRA) came into Round 2 looking to improve on his results this season and move up the rankings after a disappointing first half of the year. After a slow start the Brazilian seemed to find his form, surfing tight in the pocket, getting vertical and throwing spray in his bout against Glenn Hall (IRL). A broken board ended Hall’s chances and he was eliminated from the competition in 25th place, while a series of backhand snaps from Medina for a 9.07 secured his victory. The first upset of the day came when injury replacement Alejo Muniz (BRA) took down World No. 5 Taj Burrow (AUS). Muniz, who is surfing in his fourth consecutive CT event of 2015, reached the Quarterfinals at the J-Bay Open last year. An exciting back-and-forth battle unfolded between the pair and Burrow, former event winner, was left in need of a 7.94 in the final minutes. Impressive railwork combined with power and speed netted Muniz an excellent 9.30 and a place in Round 3, sending Burrow home with his worst result of the year. Adam Melling (AUS) was next to deliver an upset, sending home two-time event winner Jordy Smith (ZAF) in Round 2. A pair of seven-point rides were enough for the Australian to clinch victory while Smith was left searching the lineup as the clock ran down. The South African was eliminated from the J-Bay Open in 25th place for the first time in his career while Melling moved onto Round 3 where he was defeated by Nat Young (USA). Young previously delivered an impressive performance against Brett Simpson (USA) in Round 2. Currently ranked 7th on the Jeep Leaderboard, Young’s precise backhand surfing in the pocket earned him a 17.10 heat total and the win. The shock exits continued in Round 3 when World No. 30 Adrian Buchan (AUS) defeated World No. 3 Owen Wright (AUS) in a narrow last-minute victory. The win is the first time Buchan has beaten Wright in man-on-man heats and is his best result of the season, improving on his 13th place finish in Jeffreys Bay last year. Wright, who previously defeated replacement surfer Tomas Hermes (BRA) in Round 2, was eliminated in equal 13th place and will have to set his sights on the next event in Tahiti.